Has Beacon Hill already botched the Rosenberg investigation? 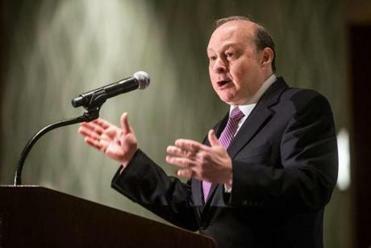 State Senate president Stan Rosenberg stepped away from his post temporarily after the allegations against Bryon Hefner. HAS BEACON HILL already botched the Stan Rosenberg investigation? In the controversy involving the former Senate president, critical witnesses who could speak about his husband’s influence and behavior are backing away, afraid of talking to the investigators hired by the Senate. Rosenberg’s husband, Bryon Hefner, has been accused of sexually assaulting men who work in politics, while hinting that he could use his sway with Rosenberg to help those who yielded to his advances. The men, whose careers rely on good relations with Beacon Hill, have been hesitant to cooperate — especially since the Senate’s process doesn’t protect the anonymity of subpoenaed witnesses, and some senators have mused publicly about reinstating Rosenberg to office. A recent WGBH story revealed that the investigators must seek permission from senators on the ethics committee before issuing subpoenas, raising questions about whether the probe could be truly independent and “comprehensive enough to be credible,” as a Senate staffer put it. The committee is stocked with Rosenberg’s loyalists, raising further doubts. Only one of the four men who made assault and harassment allegations against the husband of state Senator Stan Rosenberg has spoken to investigators. Many Beacon Hill insiders feel confident Rosenberg will be cleared, in the sense that investigators won’t find evidence he knew of his husband’s alleged assaults. But that’s not the only question. Another is whether the Senate president’s office was compromised by Hefner, who had boasted of his clout. Another is whether Rosenberg can be trusted. Three years ago, Rosenberg promised to keep his personal life and his legislative duties separate, after a series of embarrassing social media posts by Hefner surfaced, in which he bragged about his sway with the senator. That “firewall” clearly didn’t materialize. Senators need to be careful before accepting Rosenberg’s word again. According to a spokeswoman, Rosenberg and Hefner have separated; Hefner is currently undergoing treatment for alcohol dependency. The Senate shouldn’t reinstall Rosenberg unless investigations clear him, and until senators feel confident that none of Hefner’s alleged actions can be repeated. No matter how much other senators like Rosenberg, a safe workplace should come first.